Your success depends on your ability to communicate with students, and a good strategy creates the best results. This guide will help you identify attainable goals for your department and then show you how to install a plan to reach them, including important best practices to avoid pitfalls and increase your reach. Why do you need a texting communications plan? Why do you need a student texting communications plan? Before we get into the plan, let’s talk about the main reason you need to be texting students: because the effectiveness of other mediums is quickly diminishing. Students don’t open their emails. If you call students, you’ll likely go straight to voicemail. And with social media, “You can tweet something, and within two minutes, it’s 80 messages down their timeline,” noted Andy Storms, director of student success at Ozark Christian College. It helps increase matriculation rates1 and encourage retention.2 “Having their phone vibrate when you send them something is pretty invaluable,” stated Jeff McNamara, director of student success at Carroll University. More and more institutions are texting college students and achieving exceptional results, including fewer missed deadlines, higher attendance at events, and even reducing hunger on campus. So why do you need a strategic communications plan? Because jumping into texting without one could burn the medium. We saw what happened with email when we opened the floodgates. Many universities struggle with email open rates as students were inundated with irrelevant emails. Just like with email, if you send too many texts, you’ll lose students’ attention. If you’re too formal, you won’t get a response. And if you don’t have a plan (including ready-to-go templates, which we cover in Step 6), your staff will end up wasting their time instead of building stronger relationships with students. Texting is so much more personal — and so much more powerful — than email and other mediums. As hundreds of schools have already discovered, it’s worth the time to do it right. How to create and implement your texting communications plan. Below, you’ll find step-by-step instructions for building your student communications framework. Whether you’re already using texting extensively on campus — or you’re just starting to think about ways to improve student outcomes through texting — you’ll get expert advice, learn about proven best practices, and discover exactly how to create and implement an effective plan for your institution. Before you start thinking about all the fun emojis you’re going to send students, think about what you want to achieve through texting. What are your departmental objectives? What are your institutional goals? What are the key metrics you use to measure success? When you’re writing your goals for a student communications plan, be specific, and choose your words carefully to get everyone on the same page. For example, instead of just saying you want to improve student success, consider a more concrete goal such as increasing retention by 10%. For each of the objectives you identified in Step 1, identify 3 – 5 touchpoints. A touchpoint is simply an opportunity to communicate with a student in a way that supports your ultimate goal. By identifying these touchpoints, you can start to determine when and how you can use texting to achieve your objectives. At Carroll University, the student success team assigns all full-time undergraduate incoming freshmen to a staff member. Texting students during the summer helps them feel more comfortable once they’re actually on campus. 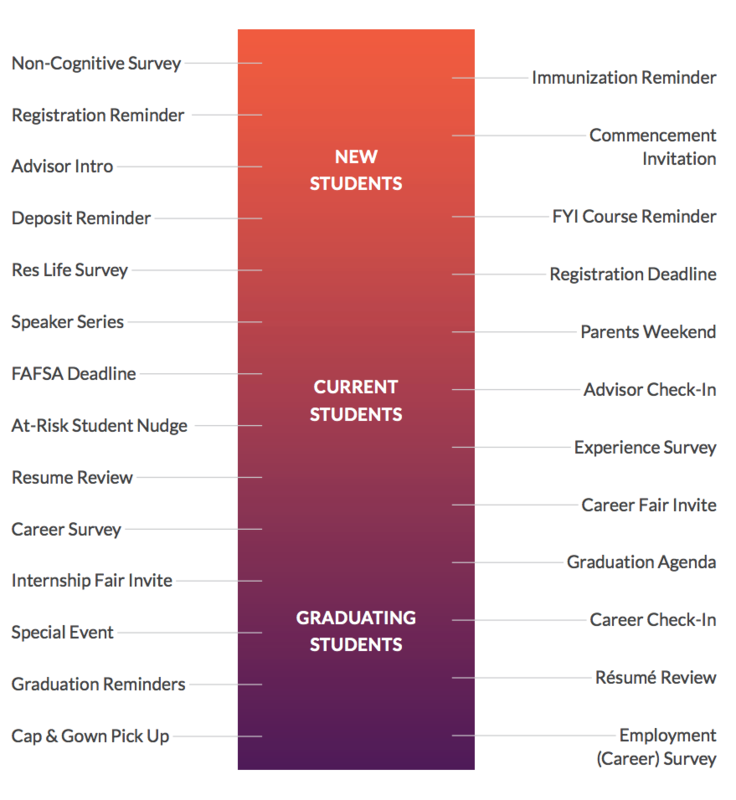 Yes, freshman year is very important — but take the time to consider how you’ll communicate with students throughout the student lifecycle, especially as you focus on retention and career services. Every department thinks they have something important to say, but trust us — students don’t want 20 texts a day from you. “It’s been such a great tool that we’re concerned about overtexting and having students opt out because they’re getting too much,” said Amy Gray, vice president of student success at Aurora University.3 Some schools use separate calendars to track when each department is sending texts, emails, and other communications. Nudges are “a huge part of student success,” noted Kathy Woughter, vice president for student affairs at Alfred University. A nudge can be a gentle reminder about an upcoming deadline, a text about counseling services for students who are stressed out during finals week, or information about a career opportunity. Don’t be afraid to think outside the box when you’re thinking about touchpoints. For example, Alfred University wanted to help address student hunger. Now, when there’s leftover food at the end of a catered event, the campus dining staff sends a text to students who have signed up at the campus food bank. Hungry students come and get the free food, and campus dining has less waste to deal with — all thanks to one text. Sending a text or an email — or even having a face-to-face meeting — isn’t your ultimate goal. Your real objective is to achieve a higher graduation rate, retention rate, or some other measure of student success. Touchpoints are simply the way to get there. Now that you have a better sense of how and when you can use texting, take a step back and consider how it fits in the context of your overall communications strategy. If emails, campus flyers, and other mediums are working for you, plan to keep using them, at least on a limited basis. Yes, texting is more effective than other mediums — but it isn’t a magic wand that will immediately replace all of your other tools. Are there any reasons why your students wouldn’t be receptive to texting? How will your campus leadership feel about using texts to improve retention, graduation rates, and other key metrics? What proof will they need to see that texting works — and when will they want to see it? You can’t anticipate everyone’s reaction, but thinking ahead will help you identify any likely challenges, so you can plan now on how you’ll address them. Any SMS texting platform will let you text your students, just like any car will let you drive across town. But — just like buying a car — it’s important to think about how you’re really going to use it. What if you want to go further? What if someone else wants to use it? Is it easy to use? Does it fit in with everything else you’re doing? What are the legal and safety issues you need to consider? Who will maintain it? These are a few of the questions to consider as you decide which texting platform is right for you. What is a texting platform? A texting platform typically lets staff members use a computer, tablet, or smartphone to send text messages to a student’s mobile phone. To the student, the message appears as a normal text. For the staff member, the texting platform lets them track conversations, integrate with their student information system, send messages to groups of students simultaneously, track results, and provide access to colleagues and department heads who may also need to view conversations or communicate with students. A texting platform removes this risk by providing staff with an institutional phone number, typically one that looks just like a regular phone number from your area code. Students still feel as if they’re texting directly with staff, but your staff doesn’t have to give out their personal phone numbers. If other departments will be using the texting platform, invite representatives from those units to be involved in the selection process early on. Their input and feedback can help ensure that whatever platform you choose will be a good fit for everyone, thereby maximizing the institutional investment, and making sure that everyone’s using the same tools (and sharing their results). Having a general idea of how texting fits in your plan will help you determine what type of texting platform you need. Will you be texting students mostly one-on-one, in small groups, or will you be texting all students at once? How often will you be texting? INTEGRATION How does the platform integrate with your student information system (SIS)/student success system? APPEARANCE How will messages you send appear to students? CAMPAIGNS Ask about the ability to send campaigns to groups of students, track mass messages as campaigns, and review reporting related to each campaign. TEMPLATES Can staff members quickly choose a prewritten template for common messages and responses? SUPERVISORY ROLES Can supervisors oversee staff texting accounts and monitor them for appropriate use? ENTERPRISE FUNCTIONALITY How do you ensure a consistent experience and department-level flexibility? For example, ask if each department can see the information about each student that matters to them. SECURITY How safe is student data? COMPLIANCE Ask if opt-outs are recorded in the platform and in your CRM/SIS. DATA VALIDATION Does the platform have a way to validate that each phone number you collect is a valid, mobile phone number? TRAINING AND SUPPORT Who will help you set it up and ensure you’re getting the best results? MEASUREMENT AND TRACKING Can you measure engagement and outcomes, and does your texting platform provider offer historical guidelines for what to expect based on your type of school, student mix, and other factors? USER EXPERIENCE People have high expectations. If the user experience isn’t exceptional, your colleagues will either struggle to use the platform, or simply stop using it altogether. Just because you can text someone doesn’t mean that you should. In this section, we’ll cover some proven best practices for texting students. Your texting platform provider should also be able to provide you with additional best practices. Is this valuable for the students? “I learned through trial and error that...when you’re starting a text conversation, in that initial text, you need to identify who you are, or you will get a lot of replies from people saying, ‘Who is this?’” noted Amy Gray from Aurora University. Yes, identifying yourself takes up valuable space in your text. But otherwise, you’ll just end up going back and forth with students, explaining who you are and why you’re texting them. Sometimes, you need information from students (e.g., you need to know if they’re returning next semester). Other times, you just want to make an announcement (e.g., schedule change for an event). You’ll want to write your text differently depending on your goal. IF YOU WANT A RESPONSE End your text with a relevant question, so it’s clear that you want students to reply. IF YOU DON’T WANT A RESPONSE Make sure the text contains all the information that students need. Don’t force students to guess what you want them to do next. Provide a clear call to action, whether that’s directing them to your website or responding back to the text. Because texting is a more casual, everyday medium, many schools prefer to keep texting associated with positive (or at least neutral) messages. If you need to communicate bad news, consider sending a letter or other more formal correspondence. Use natural, conversational language when you’re talking with students. Rule of thumb: read your message out loud. If it sounds strange to say, it’ll be strange to read on the other end. Mongoose University: You have applied but we have not received ur transcript. Rply STOP2 end. Std msg rates apply. Hi Chris – it’s Steph from Mongoose University. Looking at your file, I see you applied, but we have not received your transcript. Are you still interested? Let me know! Thanks. Even when you’re texting, you’re still representing your institution. Students expect slang and abbreviations (and 2 a.m. texts) from their best friends — not from their university. Using emojis shows students that you’re approachable and fun. Just don’t go overboard. Stick to the emojis that have a clear meaning. This emoji looks like a crying face, but the “tear” is actually supposed to be a bead of sweat, showing that you’re feeling relieved. Whatever you do, don’t skip this section. Seriously. Creating content templates is one of the most important steps of the process, since templates are the foundation for most of the text messages you’ll send. Content templates are text messages that you write ahead of time, with specific audiences and opportunities in mind. Once you have your templates, you can use one of your templates as a starting point when you need to send a text, and simply adjust the text as needed. Think of your template as a tried-and-true recipe. Sure, you might take out the onions or add a bit more salt to your recipe — just like you might change a few words in your template depending on your audience. But in general, your template is your best formula for what works. For example, here’s a template for students who are not registered yet. Hello <FIRST NAME>, this is <STAFF FIRST NAME> <STAFF LAST NAME> with the Advising Center. I noticed you have not registered yet. Are you planning on returning to MU for the Spring 2017 semester? As you can see, the template will automatically pull in the student’s first name and the staff member’s first and last name (please note the formatting may be different depending on your texting platform). MORE EFFICIENT Instead of reinventing the wheel each time you have to send a text message, you can simply refer to your templates. LESS RISK Like any medium, text messaging can be misused. Writing templates ahead of time (and having them approved by leadership) helps reduce the potential for confusing language and other missteps. IMPROVED RESULTS Your template should have the most effective, up-to-date language; you can (and should) keep testing different approaches, but your template gives you the strongest starting point. In Step 2, you identified the opportunities to reach students throughout the student lifecycle. With these touchpoints in mind, you can write a content template for each touchpoint (or more than one template per touchpoint, depending on the opportunity, audience, and other factors). Ideally, you should have enough content templates to cover approximately 80% of your touchpoints. This lets you be efficient, while still allowing for the 20% of texts that may need a more customized or personal approach. Texts may be sent to an individual student or a group of students. When the message is personal in nature, the student should always feel you are texting them directly. Melissa McAllister will be hosting “Coffee and Career Conversations” with senior business majors on April 28th at 4:00 p.m. Learn about helpful interview tips and job openings! Hi <FIRST NAME>! This is your Career Counselor Amanda at Mongoose University. “Big Four” accounting firms are visiting campus April 28th. We have time slots open 12:00 – 5:00 p.m. Are you interested in signing up? Hi <FIRST NAME>! Mongoose “Get Hired” Career Fair is March 14th. Connect with over 100 employers. Dress to impress! Do you have any questions? Register at http://goog.gl/pg475. Hello <FIRST NAME>, last year, you filled out a FAFSA and this year you did not. If you would like to receive financial aid, please visit: www.fafsa.gov. For questions, please text us or visit our office. Hi James! Dr. Janicki here. We need to take a look at your prerequisites and course load in general. Can you come in this week? Hi <FIRST NAME>! This is <STAFF FIRST NAME>. Some of your midterm grades are looking a little low, and I want to make sure you’ve got what you need to be successful. Have you looked into visiting the tutoring center? Start small. Think about who needs to text students — not just who wants to text students. You can always add more staff once you’re up and running, if they’re needed to help you achieve your goals. Everything should tie back to your objectives. For example, if one of your goals is to improve your retention rate, then the people responsible for that specific goal should be able to text students (or at least have significant input in terms of when and how to text students). Make sure everyone is aligned with your goals, regardless of what individual motivation they may have. For example, student engagement staff are typically focused on driving students to events. But before they start texting students, they should understand all of your objectives — including how attendance at events fits into the bigger picture. “It’s really important to coordinate across campus,” noted Amy Gray from Aurora University.12 “Make sure you’re getting all those folks around the table, and talking about how — and in what circumstances — you will be using [texting].” Many campuses create a text messaging policy that outlines exactly how texting should — and shouldn’t — be used.13 Don’t forget to train everyone in best practices, which we covered in Step 5. Which departments are allowed to text students? How often is each department allowed to text? Will everyone in each department be able to text students, or just specific people? Will each student be assigned to a staff member in the texting platform? What access and responsibilities will administrators have? In some text platforms, you can choose to either assign students to a specific staff member, or allow any staff member to text with any student. Assigning students can be helpful when you’re doing advising or other tasks that involve one-on-one outreach — but it can also hinder the ability of colleagues to help with shared workloads. Think carefully before you decide how to set up your platform. In order to text with a student, you need their mobile phone number. Even once you have their number, you may need to ask for consent to text them. In this section, we’ll discuss how to get phone numbers, obtain opt-ins (when needed), and let students manage which texts they want to receive. What about FERPA and texting? Whatever you do for student emails and phone calls, just apply the same logic and policy to texting. It’s really that simple, because texting is just another medium for communicating with students. While students may provide your school with a number they claim is their mobile number, sometimes they enter a landline number or a number that’s invalid altogether. Sending text messages to landline phone numbers or invalid phone numbers will increase your undelivered rate, which can eventually lead to carrier violations, much like spam filters for email. Your texting platform should have a validation process that tells you whether or not each number is a true, valid mobile number (some texting platforms automatically check for validation each time you add, import, or edit data). AUTOMATIC OPT-IN Many institutions choose to automatically opt students in to receive text messages, especially from business units such as financial aid and the registrar’s office. ASSUME OPT-INS FROM ADMISSIONS If your admissions team is already texting with students (who have presumably opted in), you may be able to assume these opt-ins once students are enrolled. ASK STUDENTS TO OPT IN You can ask students (through email or other communications) to opt in to receive text messages. If your school already uses texting for admissions, be clear that you’re asking students to opt in to receive text messages as a current student; otherwise, students may think that they already opted in as prospective students, and don’t have to opt in again. Regardless of how you decide to obtain opt-in, check with your legal team to ensure that your method is in compliance with any institutional policies. If <PHONE NUMBER> is not your correct mobile phone number, please reply to this message with the correct number. For more information about what types of text messages you may receive from [INSTITUTION], please visit [URL]. With most texting platforms, you can have different settings for each department, which means you can control how you get opt-in on a departmental level. For messages coming from the registrar or financial aid office, you may decide to have students automatically opted in. 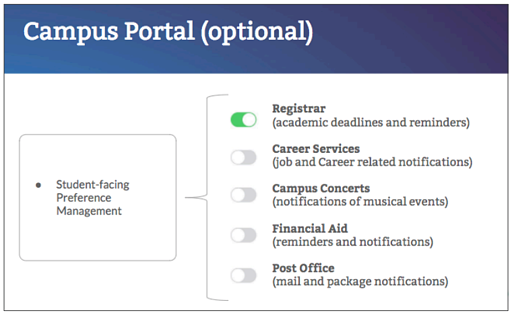 For other departments, like campus life, you may want to ask the student to opt in. 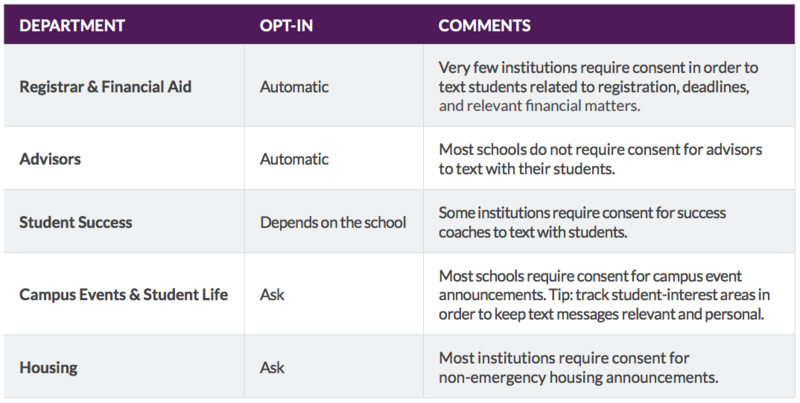 Here are some common opt-in procedures from schools that are already texting students. As you can see, we don’t typically recommend granting auto opt-in access to student life, campus activities, or any co curricular/extracurricular offices. Students can (and will) manually opt in for these texts if they want to get them. Some texting platforms allow students to determine which departments they want to receive texts from. Giving students this choice typically improves your results, since you’re only texting students who want to hear what you have to say. Students can — and will — choose to opt out from texts. When they do, you may want your staff to follow up with them, confirm that the student really wants to opt out, and let them know that they’ll only be getting critical information via text. The big day is here, you’ve finished crafting your communications plan, and now you’re ready to start texting students. Here’s how to make sure everything goes smoothly for your staff, your leadership, and your students. If you want students to proactively text you (and not just respond to texts that you send), make sure they know how. Your texting number(s) should be on your website, your business cards, flyers, and other student-facing communications. At Aurora University, a biweekly text-messaging-users-group meeting gives staff a chance to review how texting is working, share best practices, and plan for future communications. Students see texting as just another way to get in touch with you. At one university, for example, students were having a problem finding a meeting room — so they texted a staff member to find out where they were supposed to be. It’s not how the staff intended texting to be used — but you can’t always control how your audience will use it. Ultimately, texting is the best resource to discover the needs and concerns of your students and keep them happy. With texting, it’s easy to see the results, often in just a few minutes or hours. But it’s important to look at the right data — and know how to use it. Everyone wants to know what a good response rate is when texting. But response rate is only one metric. Ultimately, student behavior is the most important metric, which can be answered by asking an even simpler question: are they doing what you want them to do? Go back to the objectives you established in Step 1, and see how your results measure up. What’s a good response rate? It’s normally between 50 – 75 percent, assuming you have clean data and a solid content strategy. That said, some messages are more informational, and are not designed to elicit a response. For those messages, consider using the auto- reply feature (available in some texting platforms) for students who reply to the text looking for more information. TIMING When in the student lifecycle is it best to text students for each of your objectives? LANGUAGE Are there certain words or phrases that get students’ attention? FREQUENCY How often should you send texts? You’ll have plenty of hard data to show your colleagues why texting works. But sometimes a story is even more impactful. Once you start getting results from texting students on campus, you can use what you’ve learned to help others on campus, discover additional opportunities to work toward your institutional goals, and even find ways to advance your own career. As more schools consider and implement texting platforms, there are more and more opportunities to share your expertise — and your results — with others outside of your institution. Whether you want to speak at a conference, participate in a webinar or panel discussion, or be interviewed by industry publications, you’ll have numerous opportunities to talk about how well texting works at your school. Let’s be honest — everyone likes to be recognized for great work. One way to stand out — on campus and throughout the industry — is to be an advocate for texting students. Why? Because it shows that you’re using innovative solutions to address specific challenges, improve student outcomes, and get better results. At Mongoose, we’re a great source to help you get the word out and promote yourself and your institution. If you’d like to be a part of our latest webinars, podcasts, and case studies, contact us here. Creating, implementing, and managing a texting communications plan for current students takes planning, collaboration, and ongoing work. But the results are truly transformative. Texting can help you achieve your objectives in student success, engagement, retention — and far beyond. Determine if texting is right for your institution (hint: it probably is). Set a goal deadline for having a texting platform in place; depending on your schedule, the software evaluation process, and budget cycles, this process typically takes 6 – 18 months. Identify which team members and others across campus (e.g., information technology) will be involved with each of the steps outlined in this plan, and share this document with them. Stay up-to-date on texting by following industry leaders on social media, attending texting workshops and presentations at conferences, and reading relevant blog posts and articles. Download the PDF version of this guide for free. 1 White, S. The Cost Effectiveness of Texting to Nudge Students Towards College Matriculation. Chicago Policy Review. 2 Boath E, Jinks A, Thomas N, Thompson R, Evans J, O’Connell P, Taylor L. Don’t go with the ‘FLO’ - a student mobile texting service to enhance nursing student retention. Nurse Education Today, October 2016. 3-4, 6, 10, 12, 14-15 Texting Throughout the Student Lifecycle, Mongoose webinar. 5, 7-8, 11 Text Messaging for Student Success, Higher Ed Live Special Edition. 9 Stoner, M. Texting Teens? Proceed with Caution. Higher Ed Live, December 7, 2017.